Identifying a 'possum might not be as easy as you may think, though it shouldn't be too hard in North America. More than 60 opossum species exist worldwide. 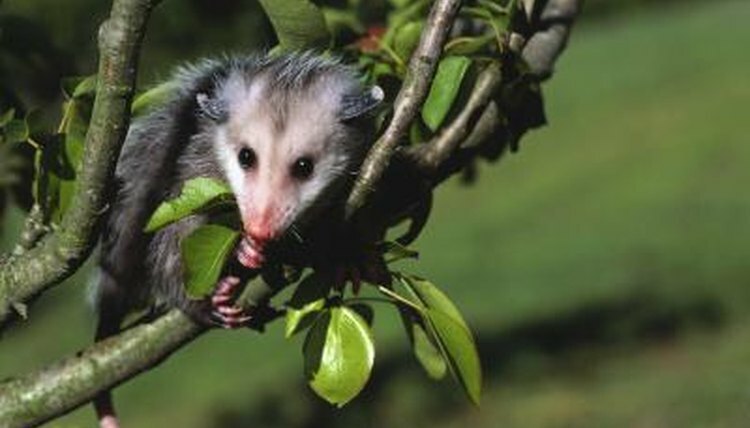 The Virginia opossum, also known as the common opossum, is the only marsupial in the United States or Canada. The common opossum typically measures about 2.5 feet long and weighs approximately 9 to 13 pounds. His coarse fur is silver with white tips around his body. He has a white face, black paws and black ears. Each of his feet has five toes, making him an excellent climber -- his hairless, prehensile tail also helps him climb. He has dark and beady eyes with a pointed snout, and a mouth full of sharp teeth -- teeth that enable him to kill small game like snakes, chickens and birds. The opossum is a nocturnal creature, so you're unlikely to identify one by the light of day -- a slow-moving, stealthy scavenger, he prefers to stay out of sight. When the sun goes down, you may spot him scavenging for food wherever humans throw it away, such as around dumpsters and garbage cans. He may make an occasional meal out of carrion -- dead animals like roadkill that he happens to come across. Because he's a good climber, the opossum travels through trees and across the tops of fences as much as he does on solid ground. If you happen upon what looks like a dead opossum, don't be so sure -- one of the traits that makes him identifiable is his habit of playing dead. When a opossum feels threatened, his most distinctive defense mechanism is to drop to the ground and pretend to be dead. He fixes his eyes in a blank stare and may even let his tongue hang out of his open mouth. This is a ploy to ward off predators, who prefer a live meal -- once the threat moves on, he'll spring back to life and make his escape. While the common opossum is the only species you'll find in the United States or Canada, dozens of other types of opossum exist worldwide, all with their own distinct looks. Australia is home to opossums including the feathertail glider. This creature is equipped with a thick, furry membrane that stretches between his knees and elbows, allowing him to glide -- something the common opossum could never accomplish. Other opossum species have like variances. Once you leave North America, identifying a possum is whole new endeavor.